Griffin, a graduate of Ohio State in 1976, has spent his professional career serving the university and its alumni. The university said Griffin was endorsed as this year’s speaker by a committee of students, faculty and staff which received hundreds of suggestions. Watch Alumni Association President Archie Griffin and Ohio State President-Designate Michael Drake discuss Buckeye alumni, Ohio State athletics and paying forward Feb. 2014. Griffin is college football’s only two-time Heisman Trophy winner. 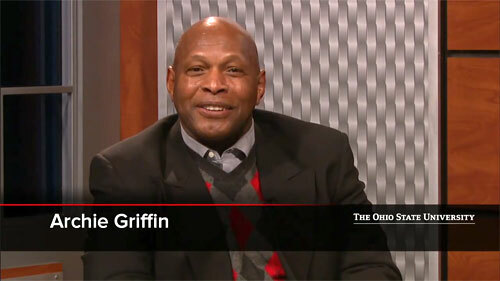 He won four Big Ten Conference titles with the Ohio State Buckeyes and was the first player ever to start in four Rose Bowls.Griffin went on to play seven seasons in the NFL with the Cincinnati Bengals. He is a member of the National Football Foundation & College Hall of Fame board of directors and is in the foundation’s Hall of Fame and the Rose Bowl Hall of Fame. Playing Field Promotions is a booking agent for motivational sports speakers and celebrities. If you would like to book football speakers or NFL stars like Archie Griffin for a speaking engagement, personal appearance or special event, you can request Archie Griffin agent and speaker information from PFP Sports & Celebrity Talent or call 800.966.1380.